A trick from the pocket of Reed McClintock! 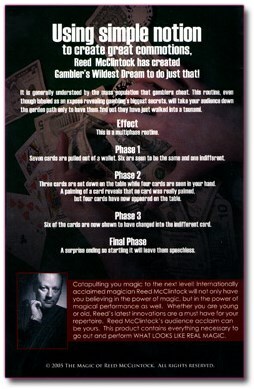 Using simple notion to create great commotions, Reed McClintock has created Gambler's Wildest Dream to do just that! It is generally understood by the mass population that gamblers cheat. 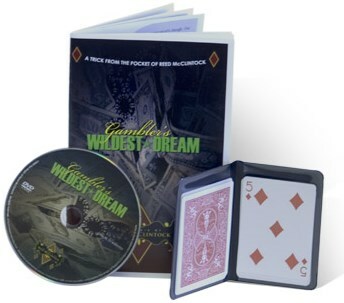 This routine, even though labeled as an expose revealing gambling's biggest secrets, will take your audience down the garden path only to have them find out they have just walked into a tsunami. Seven cards are pulled out of a wallet. Six are seen to be the same and one indifferent. Three cards are set down on the table while four are seen in your hand. A palming of a card reveals that no card was really palmed, but four cards have now appeared on the table. Six of the cards are now shown to have changed into the indifferent card. A surprise ending so startling it will leave them speechless. Catapulting your magic to the next level! Internationally acclaimed magician Reed McClintock will not only have you believing in the power of magic, but in the power of magical performance as well. Whether you are young or old, Reed's latest innovations are a must have for your repertoire. Reed McClintock's audience acclaim can be yours. This product contains everything necessary to go out and perform WHAT LOOKS LIKE REAL MAGIC.